I am somewhat opinionated on political matters, and over the years of my life have cultivated a sufficient literacy that I can discern attempts on news media to persuade rather than inform. Having done a university course on rhetoric helped greatly when I was young. 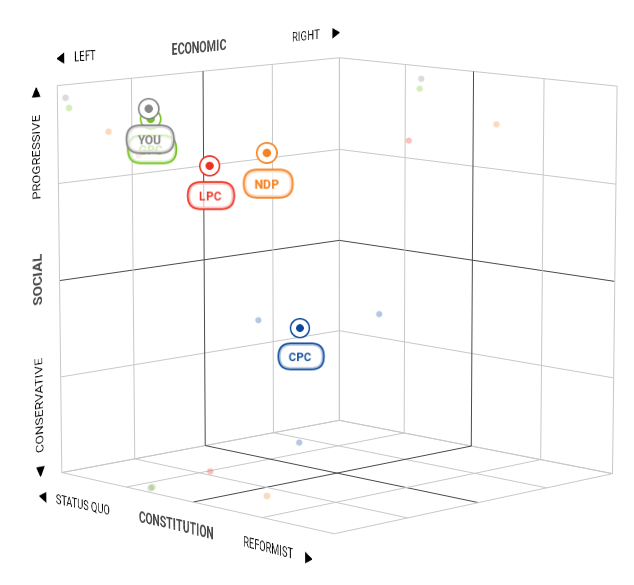 There I am, hidden behind and slightly above the Green party in progressive values; slightly to the left of the greens in economic sentiments. I am not sure how I should react to these “surveys”. Have I really become, in my middle age, a radical lefty out to overthrow the proletariat (or whatever other Marxist cliche you care to fill in its place)? 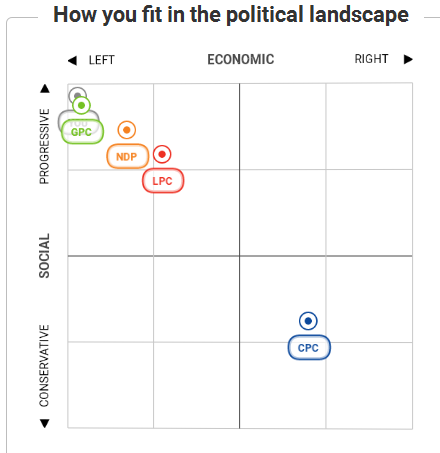 I think this is a sad commentary on the political parties rather than a commentary on myself (I think commenting on the survey participant was the intent of the survey). 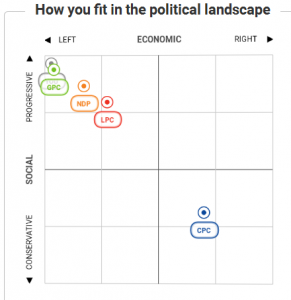 I don’t understand why, after bragging about taking nearly a million surveys, do they not compare me against other Canadians? 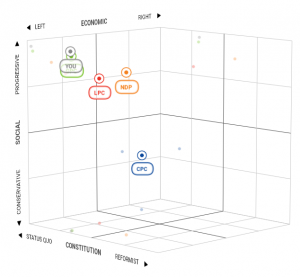 This is because I believe the parties and the media are out of touch with the population. Because I now find myself on the flakiest of flaky left of the political parties, I am supposed to feel, what? Shame for holding such extreme views such as raising tax on the rich or enhancing our medicare (which has become the worst in the industrial world not counting the United States)? I realise the media has worked hard to manage my opinions and feelings over the decades over these and many other matters. Sorry to dissappoint, I guess.